I arrived at The Jefferson with my back sort of aching. What happened was that we’d just finished a four-hour car ride in a small and cramped rental. My lower back pain began early on in the drive. I tried adjusting the car seat forward and then back. I tried sitting cross-legged and then I tried sitting with my feet up on the dashboard. No matter what I tried, that rental car and I just couldn’t make things work. What I did next was to collect the remains of our road trip from the passenger seat floor: two sippy cups, a peanut butter cracker wrapper, a half-eaten bag of pretzel sticks, and three toy trucks. Meanwhile, Chris pulled Trevor from the car seat and managed to keep him from darting into oncoming traffic. Tru slept during some of the car trip, so he was bursting with energy. Unshakable energy is a side effect of being two. I glanced at the clock. 3pm. 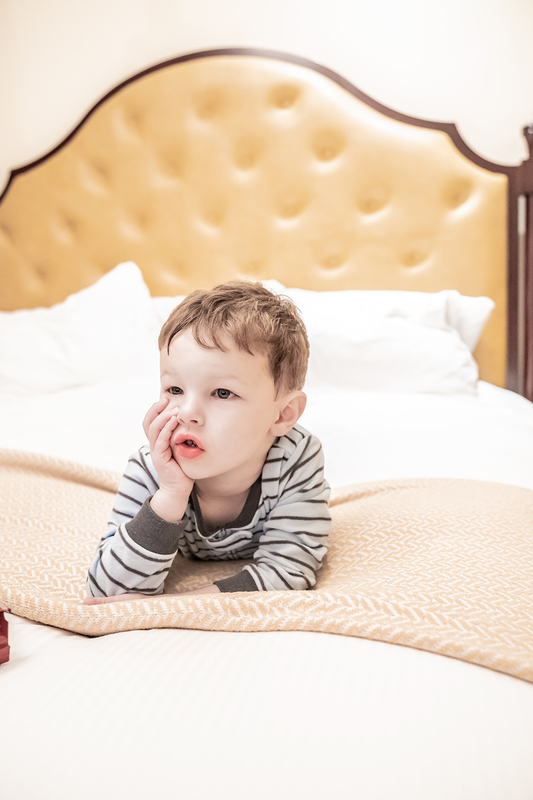 Weariness is a luxury that parents of toddlers just can’t afford. I was going to need to muster up another five hours worth of my own unshakable energy, until we reached Trevor’s bedtime. And the experience was sort of like stepping out of a bitterly cold, dirty, and noisy city street and into a warm bakery with the scent of sugar in the air. A bakery with fresh-from-the-oven cookies that are soft in the center, with chocolate chips that are still melty and gooey. In other words, it felt like I had stepped into anther world altogether. A kind and loving world that was made of pure bliss. As Trevor drove his toy car around the lobby, I had the chance to look around. What I noticed first was the lavish decor. I felt like I’d stepped into a Downton Abbey era of opulence. Imagine stunning stained glass windows in vivid colors. Even stained glass on the domed ceiling. Plus beautiful marble columns and intricate mahogany moldings. 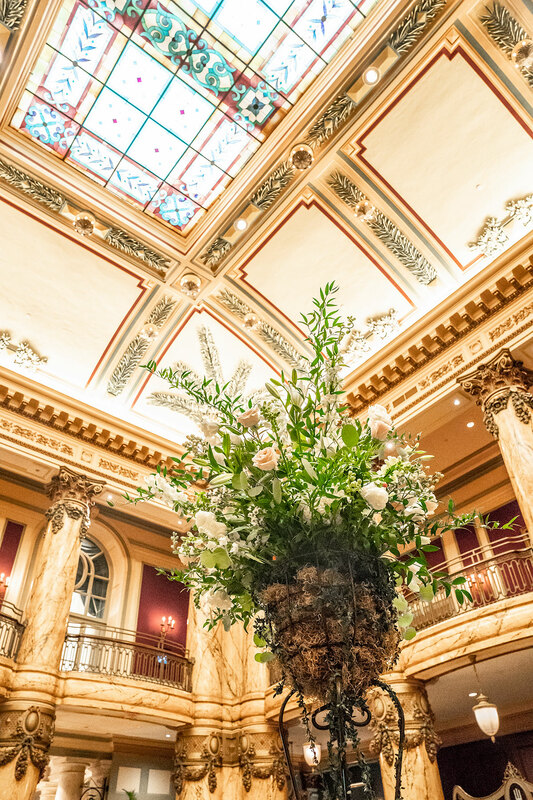 The lobby included lavish furnishings, green palms, fresh flowers and elegant white orchids everywhere. As Chris checked us in, Tru and I wandered down a staircase and into the hotel rotunda. This room was so ornate, I felt like I was touring a European palace. 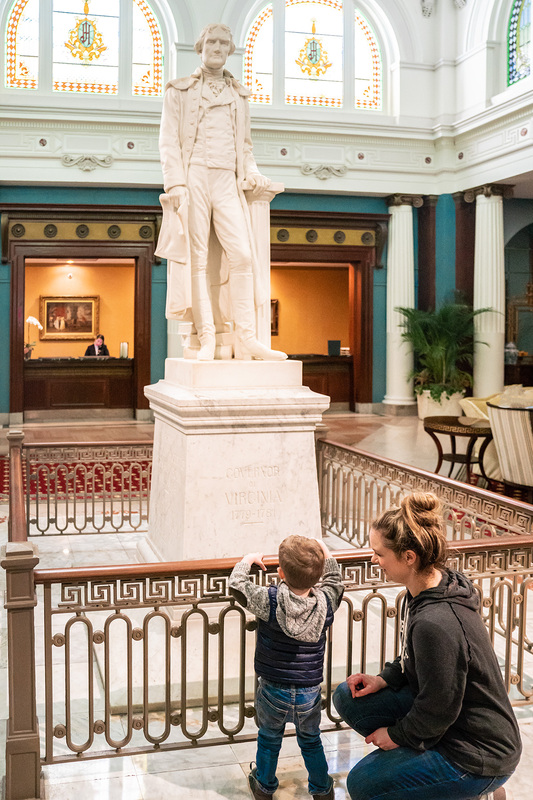 Tru was on his best behavior, so I had the chance to spend a couple of minutes checking out the history of The Jefferson Hotel. The Jefferson has a fascinating history. It was opened in 1895 and was considered one of the finest examples of Beaux Arts style in the country. But the hotel went through a lot of destruction and transformation before it was finally restored to its former glory! The Jefferson suffered two devastating fires. And it was used, not as a hotel, but as a permanent residence for army recruits during World War II. The hotel actually closed its doors completely in 1980, until it was restored by a dedicated team of designers, technicians, and artisans. 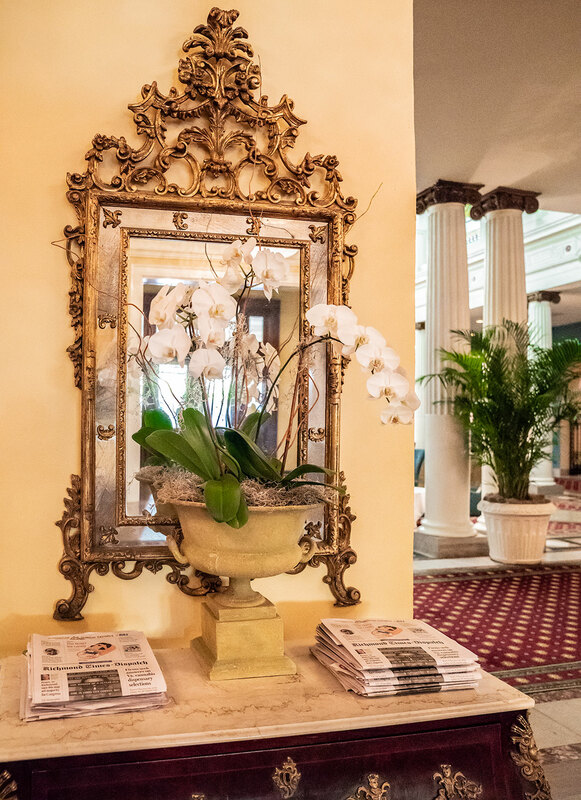 They restored original mahogany wood panels and marble columns and refurnished the hotel with original artwork and furniture. But before I could get too carried away with the history of The Jefferson, a porter approached us to show us to our room. 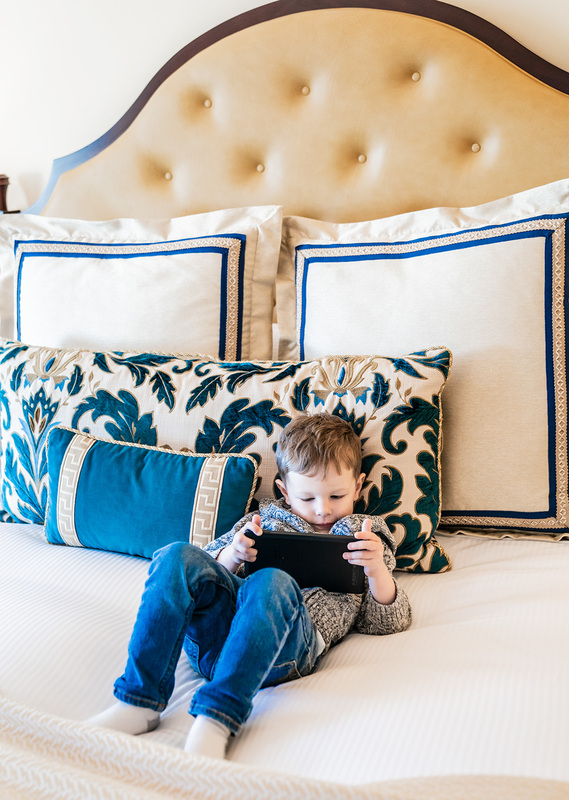 Our family is used to tight and cramped quarters when we stay in hotel rooms in larger cities. The room felt open and airy, with sunlight streaming through the large windows. 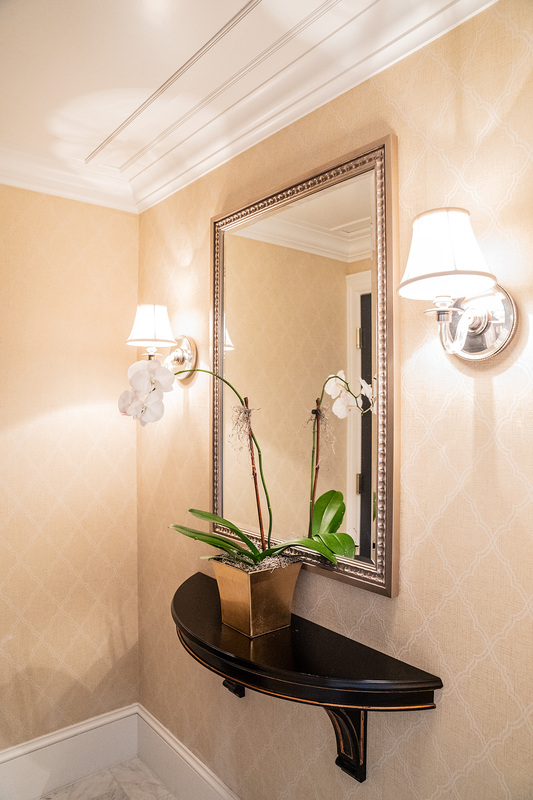 The room had an entry foyer with a mirror and table. 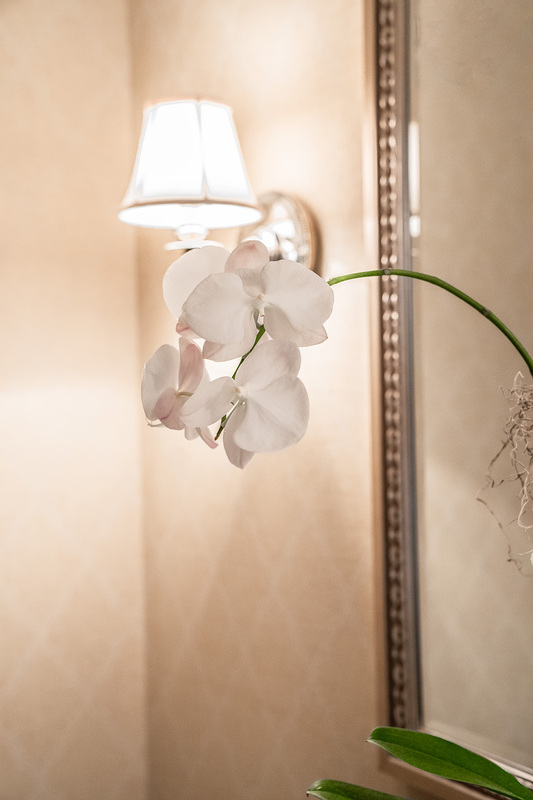 Plus a pot of live white orchids that mirrored the orchids in the lobby. The bedroom had neutral tones with dark wood furniture. 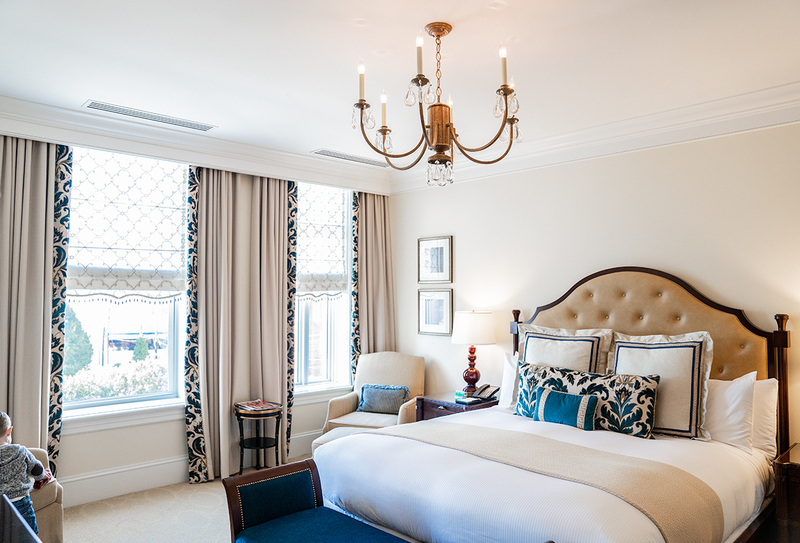 The pillows and drapes had accents of bright blue. The room had so many thoughtful details, like a small connecting room between the bedroom and bathroom. This “dressing room” had a large walk-in closet on one side and a desk facing a window on the other. The dressing room was such a convenience. It was so nice to have a place to store our clothing so we weren’t forever tripping over our suitcases. And we were able to put the room to good use. We wheeled Trevor’s crib into the space during his nap, so we could work on our laptops with some daylight while he slept. Next, the bathroom! This may have been my favorite room of all, it felt so luxurious. 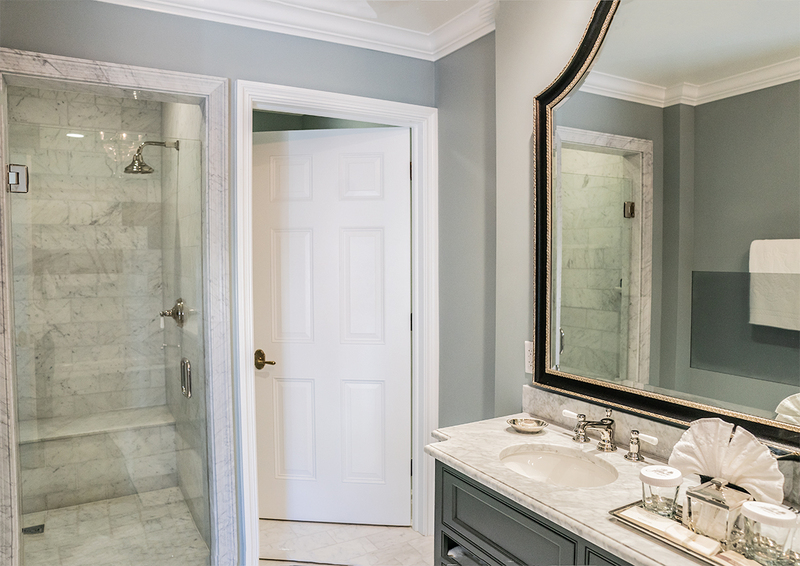 The floors, walk-in shower, and vanity tops were designed with beautiful gray marble. 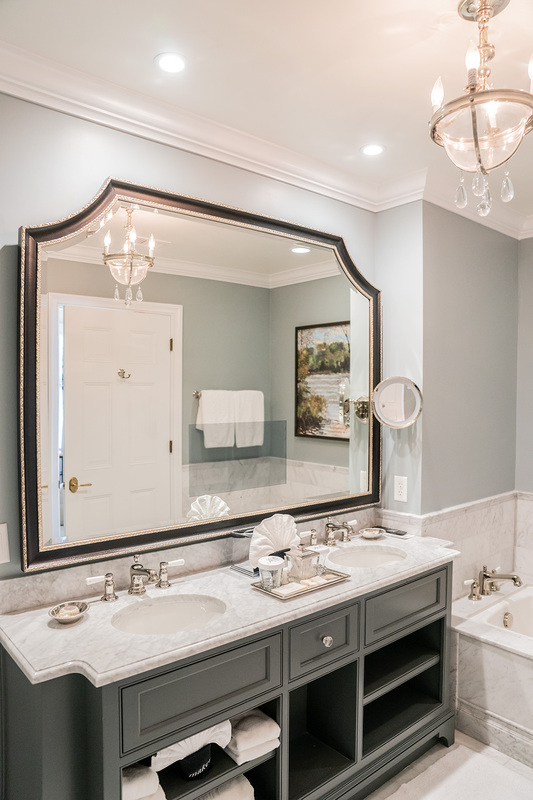 There was even a TV screen on the mirror above the double vanity. 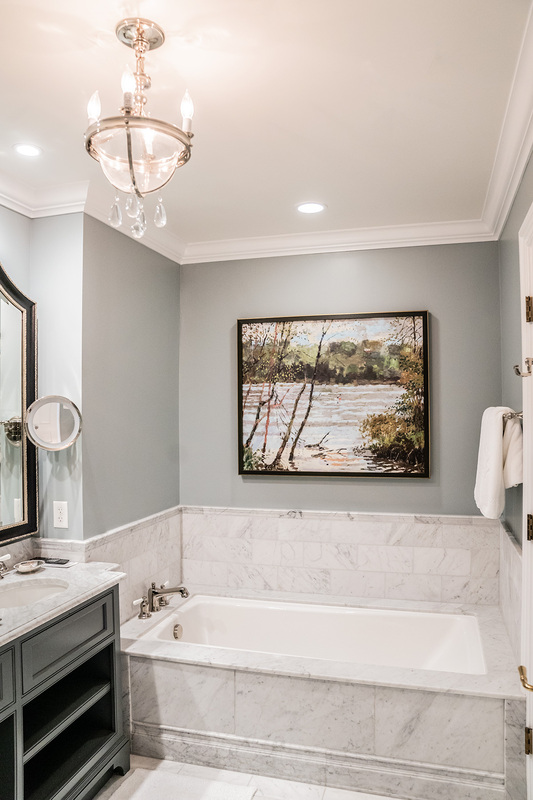 The walls were painted in a soft blue, with beautiful artwork beside the deep soaking tub. And there was a chandelier, on a dimmer switch, hanging from the center of the ceiling. When I took my shower that night, I turned the dimmer switch down to very low light, to the point where it felt like I had just a candle in the room. The scented Molton Brown soaps smelled heavenly, like citrus and vanilla. The water pressure was perfect. And the towels were thick and luxurious. It felt like I’d entered a serene high-end spa. Later on we tried the food from the hotel restaurant, Lemaire. Now, Lemaire is a fine dining restaurant. Chris and I, personally, wouldn’t be comfortable bringing Tru into such a place. 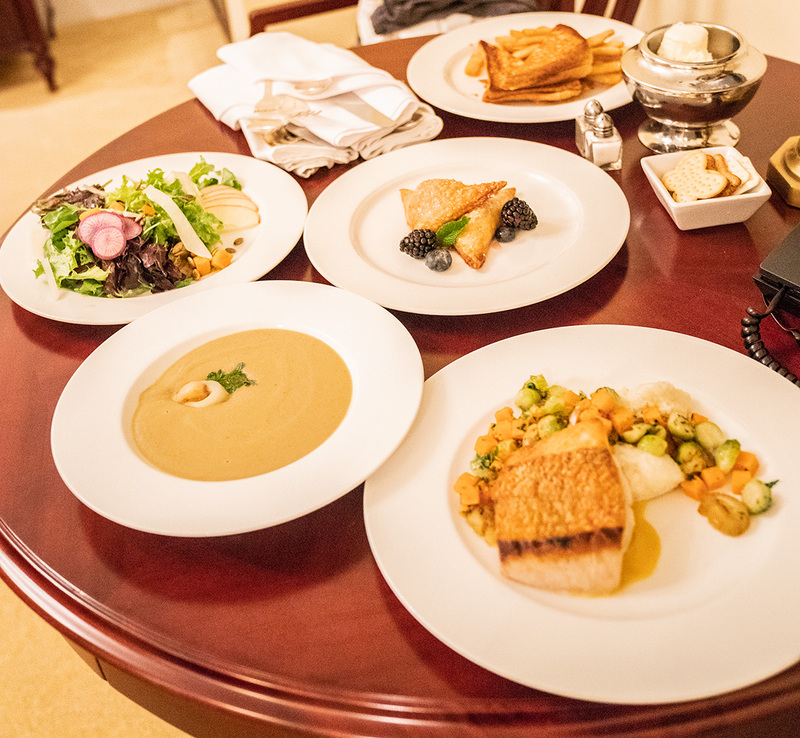 But lucky for us, we found out that Lemaire offers room service to hotel guests. This was such a unique offering, and such a rare treat to parents of a toddler! I loved the pan seared red snapper with saffron cream. Oh, and Trevor’s fries? I must have eaten half of them. In my defense though, they were just so crispy. Also, we have to discuss the bed. My back forgot everything about the cramped rental car after a night in those heavenly crisp white sheets. I should also mention the hotel employees, who were all super helpful, pleasant, and kind. 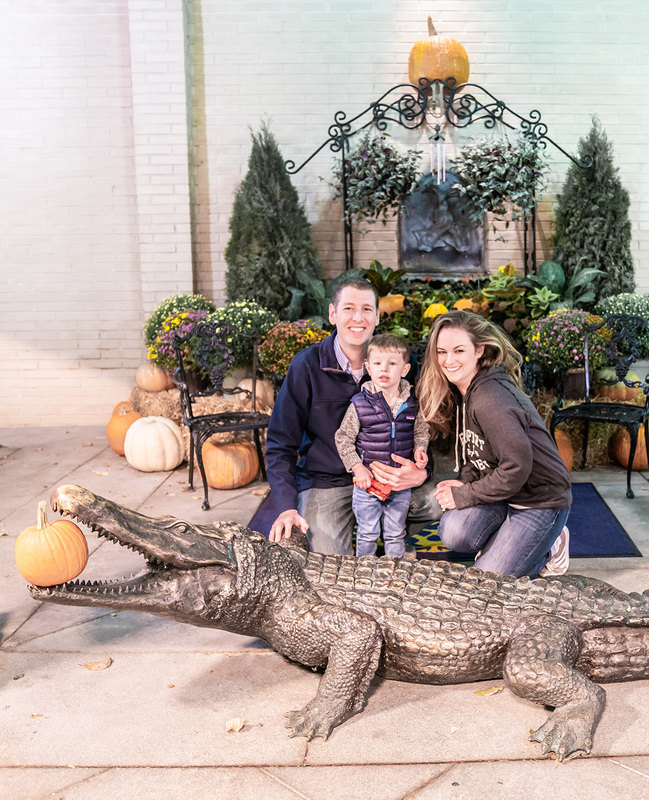 One of the valets took this family photo of us posing with the famous Jefferson alligator. That valet must take twenty similar family photos every single day, but he was really nice about it and even got Trevor to look in his direction and half-smile. You’re probably wondering about the alligator. 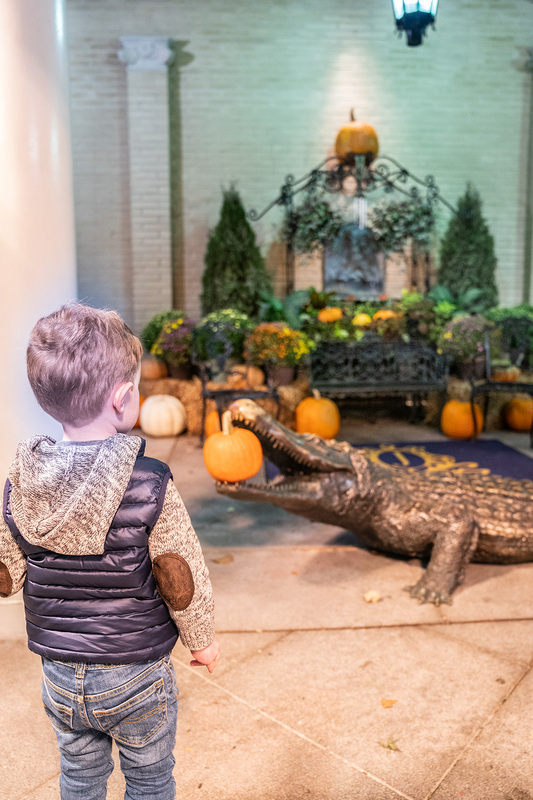 So the legend is – and hotel employees swear this is 100 percent true – that live alligators once lived in marble pools in the lobby of The Jefferson. The last remaining alligator, called Old Pompey, died in 1948. So today, The Jefferson has a sculpture of an alligator at the front entrance to honor this history. 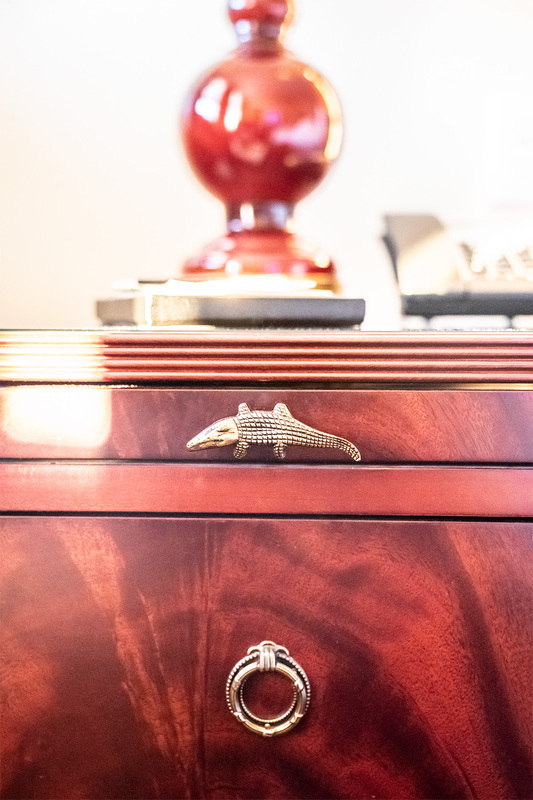 I loved the little “hidden alligator” detail I found on our hotel room furniture too! Chris and I have traveled pretty extensively. And still, The Jefferson will always stand out as one my all-time favorite hotel stays. I never thought I’d find such a dream of a hotel in a small, unassuming city like Richmond, Virginia. But The Jefferson Hotel is like that though. Full of blissful surprises. 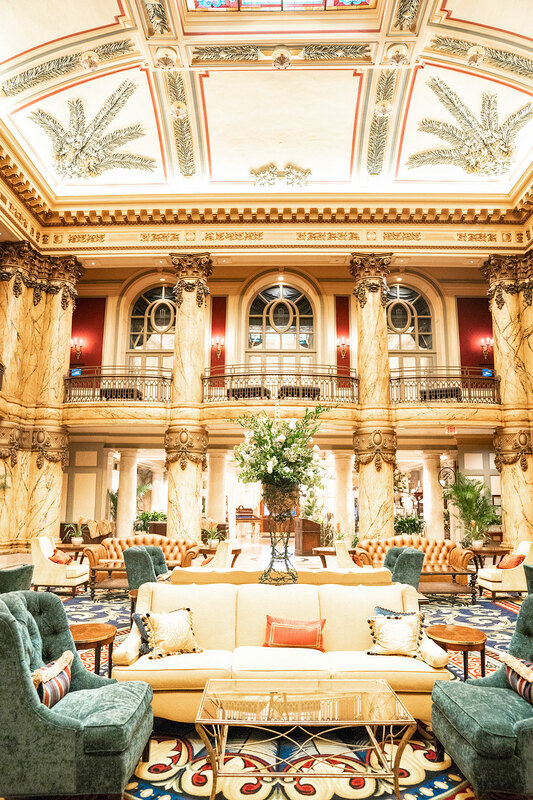 What Does It Cost To Book A Room At The Jefferson Hotel? 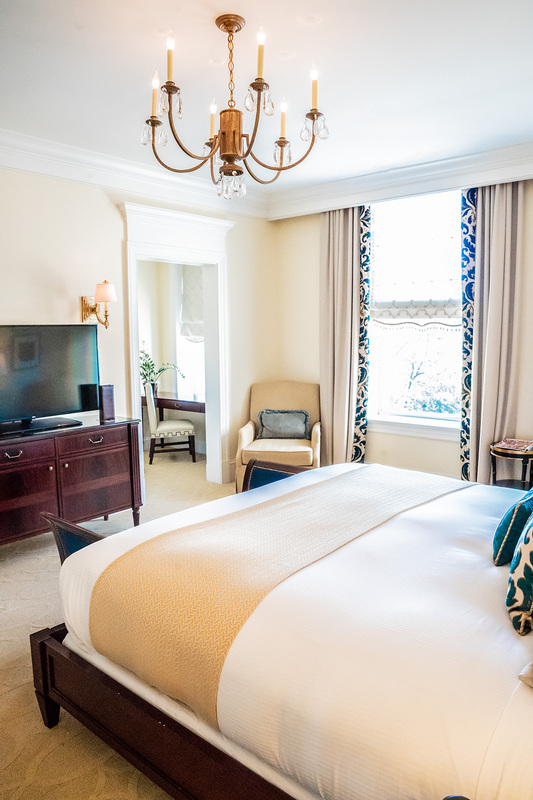 Compared to hotel rooms in big cities like Boston and Chicago, a stay at The Jefferson is surprisingly affordable! Of course, rates will vary by season. But during our stay, we found room rates between $280 per night for a standard room to $500 per night for a suite (before taxes and fees). We couldn’t believe the incredible value for the price, it’s unlike anything we’ve seen anywhere else. 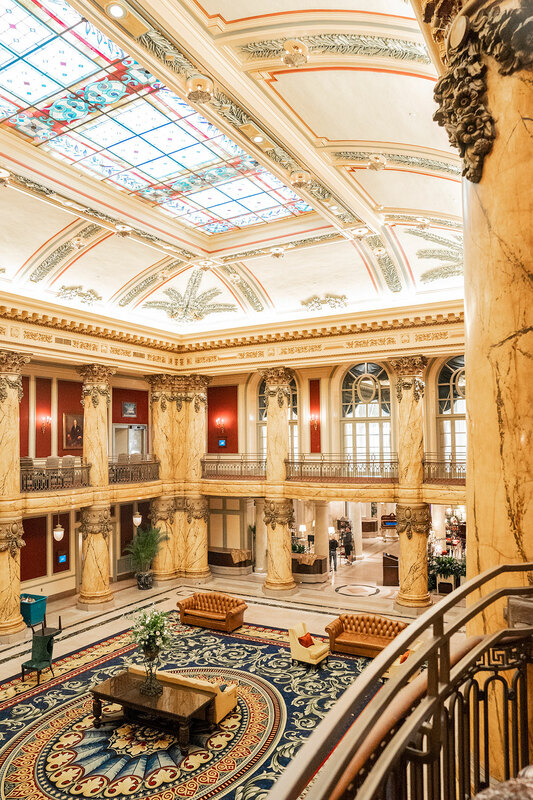 What Amenities Are Offered At The Jefferson? There are a lot of dining options at The Jefferson. 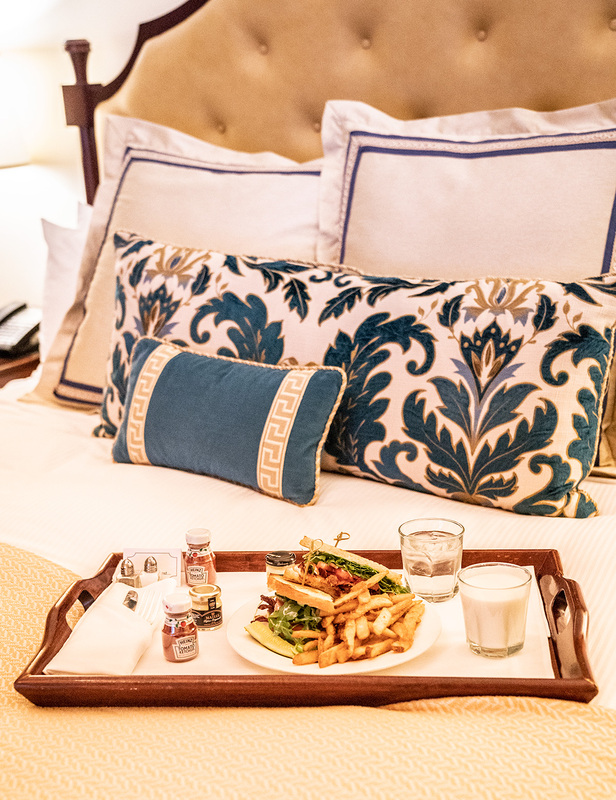 The hotel has everything from Sunday Brunch and Afternoon Tea, to a bistro with salads and sandwiches, to fine dining at Lemaire. 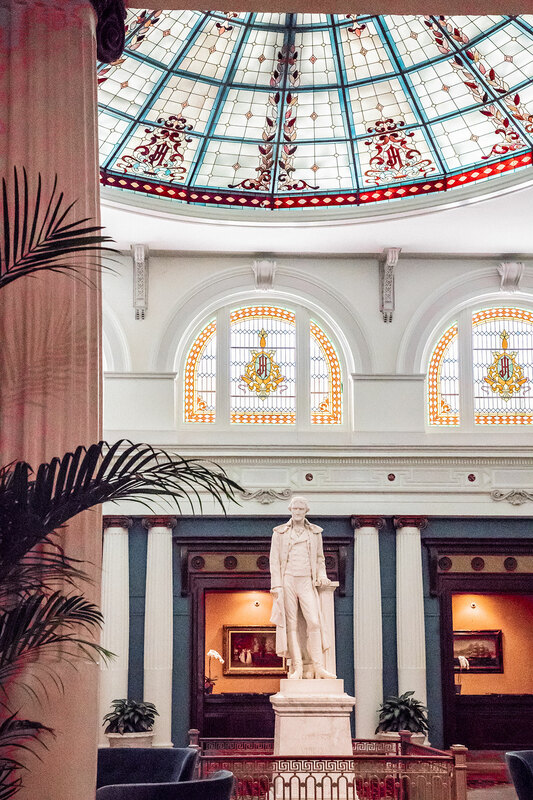 If you don’t stay at The Jefferson during your visit to Richmond, try stopping by for lunch or dinner! In addition to the restaurants, the Rotunda also includes a coffee bar, a gift shop, a florist, and a salon. The hotel also has a gym, an indoor pool, and massage treatments. Plus concierge services. 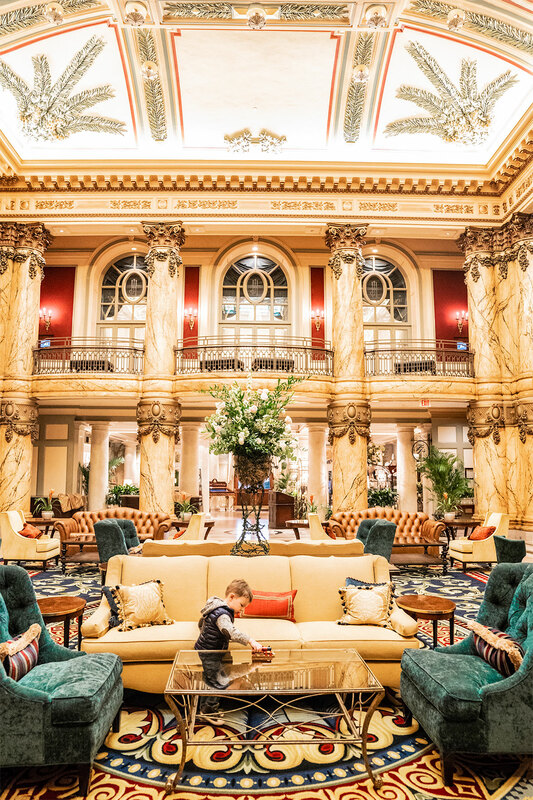 What Amenities Will I Find In My Hotel Room At The Jefferson? The Jefferson thinks of everything! During our stay, we received bathrobes and slippers. Plus nightly turn-down service. The room included a fully stocked mini bar and Nespresso coffee maker. The bathroom was also stocked with incredible bath products from Molton Brown. 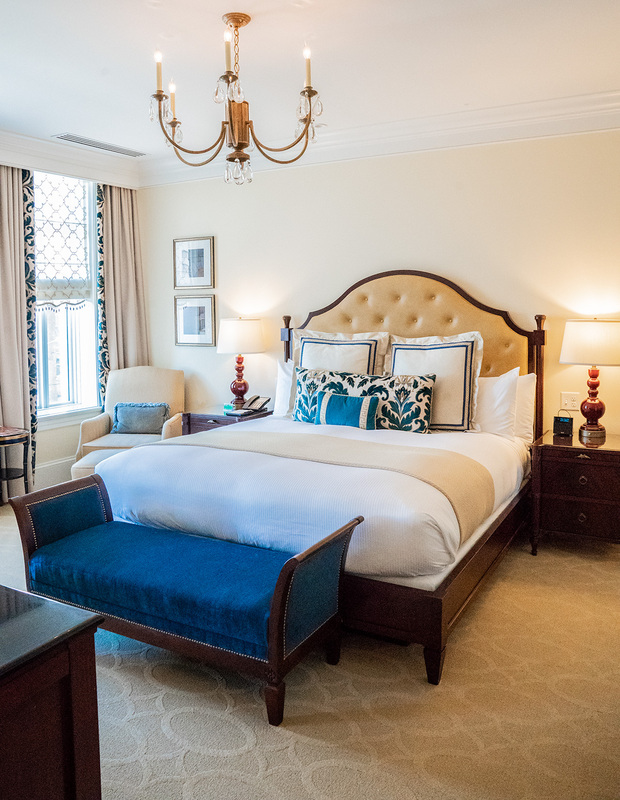 And the room featured the most luxurious linens and bath towels. Room service is available and, of course, free high-speed Internet access.